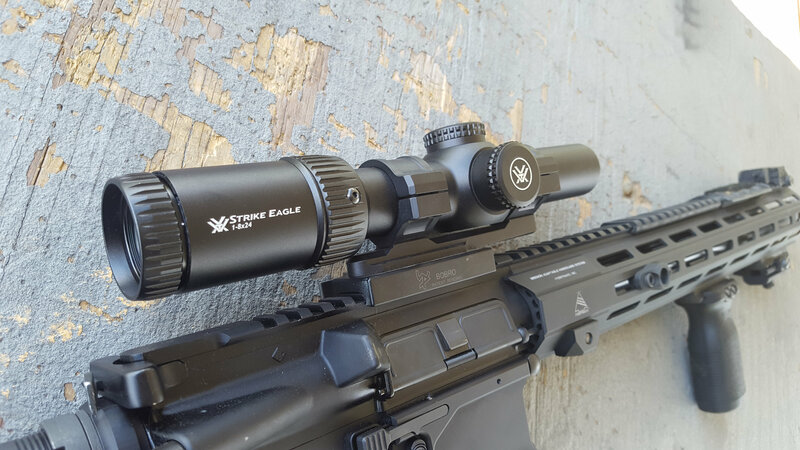 Vortex Optics Strike Eagle 1-8×24 Riflescope with AR-BDC2 Reticle (30mm Tube) for Very Fast Shooting up Close, and out to Distance! (Video!) | DefenseReview.com (DR): An online tactical technology and military defense technology magazine with particular focus on the latest and greatest tactical firearms news (tactical gun news), tactical gear news and tactical shooting news. I’ll let you in on a little secret: While most of the items I review here on DR (DefenseReview) come to me via David Crane for the specific purpose of testing and reviewing, there have been a few items purchased for my own shooting needs that have worked so well, that I felt compelled to share their performance on this site. 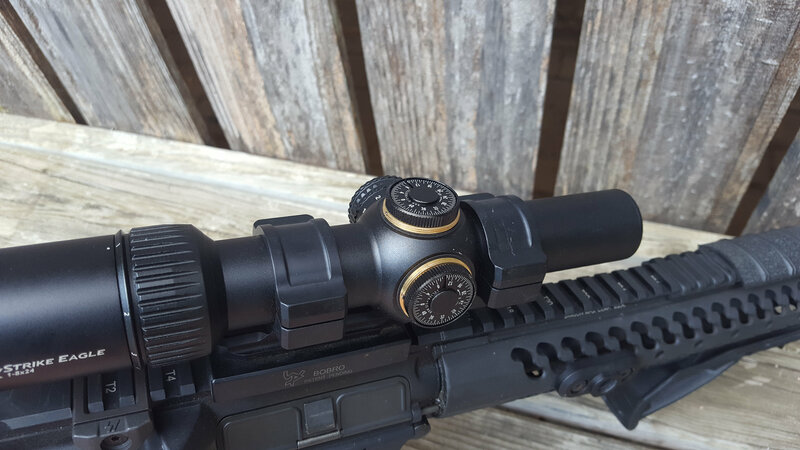 That is the case with this review of the Vortex Optics Strike Eagle 1-8×24 Riflescope. Not only is it a great deal for the money, it also represents a lot of quality and performance for a scope in its price range. I’ve found it to be outstanding! Before I go into my review of the Strike Eagle 1-8, let me get into a little of the ‘why’ I purchased this scope in the first place, as I think it’ll help answer why one should consider this scope, if they’re looking for a magnified optic for their AR. Now, if you’ve read any of my previous work here on DR, you know I’m a avid 3-Gun shooter. Although I do own a very high quality 1-6 scope for my 3-Gun rifle, and it generally works well, the fact is that there are some local matches in my area of North Carolina where I’ve found it lacking in terms of being able to get on targets fast, past 400 yards, especially small targets like 8 and 12-inch plates. This brings up an undeniable fact about 3-Gun: Courses of fire are a lot harder now than they were 10 years ago. The reason, you ask? Well, while a progression of skill, techniques, and match directors’ experience all play a part, what’s really driven the level of difficulty is technology. 10 years ago, the average competitive shooter used a red dot sight, red dot sight with magnifier, or a 1-4-power scope; and one could win matches at any level, if one had the skill to do it with these optics. Then, around 2010, 1-6 scopes really started hitting the scene. How does a higher-powered scope effect stage design? Well to have a challenging match, you need not make it impossible, but you do need to design difficult courses of fire that will challenge the shooter. You want it challenging not just for the “fun” aspect, but also to separate out the shooters’ skill via score differences. You don’t want your stages to be so easy it’s a hose fest. Well, some ways to do this is of course is to increase target distances. If the club has limited ranges, make the targets smaller and harder to hit. Referring back to 10 years ago, even at national level matches, the smallest average-size targets past 100 yards you’d see were C-zone IPSC steel targets and the Larue 28”x32” auto poppers. Nowadays, I’ve seen everything from 4-inch (4″) plates at 100 yards to 8-inch (8″) and 12-inch (12″) plates as far as 400! That’s because stage designers have to make it hard for the guys with the 1-6 scopes. So, if you can’t increase the range, make it smaller. Or, in the case of some clubs, do both farther AND smaller. So, how does this tie into the Vortex 1-8 scope? Easy. A lot of competitors are going to more power to handle these targets. With that, I think the age of the 1-6 scope in 3-Gun competition is coming to an end. 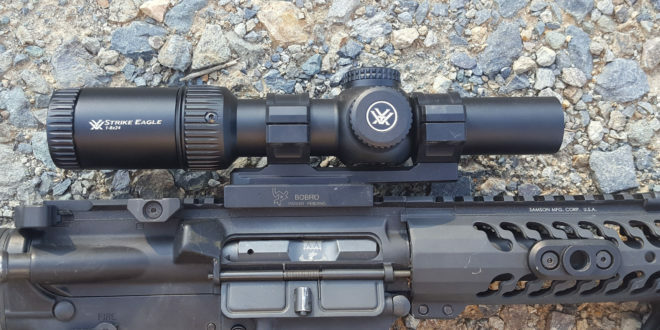 Fact is, I think Vortex Optics has their finger on the pulse of the 3-Gun world, having seen this coming–especially here in 2017, where numerous companies have also come out with 1-8 scopes. Naturally, now, as more and more 3-Gun competitive shooters go to 1-8’s, it’ll be just a matter of time before it’ll become a necessity if you want to be able to match the average 3-Gun opponent and have a chance at winning rifle heavy stages. I’ve always been a fan of Vortex products. Here, I’m shooting a 1st gen Viper PST 1-4 circa 2016 for training. Great 3-gun scope…. for 2008ish that is. Although I already owned a pretty high-end 1-6 scope (Trijicon VCOG 1-6), but I was looking for something with a little more magnification, just for those matches with shots past 400 yards, and also have a scope I could use on my Adams Arms SF 308 AR for shooting out to 600 yards. Although I also own a Vortex Viper PST 1-4., I really wasn’t sure what I was looking for. I’ll let you in on another secret: When I was searching for a 1-6 scope back in 2015, I’d played with the Strike Eagle 1-6, and totally disliked it. The BDC reticle design I think is far from really being practical. What turned me back onto the Strike Eagle line was my handling of the Strike Eagle 1-8×24 Riflescope at a local gun shop. I was able to compare it to some other 1-8s in the shop that were in the same price range. Man, what a difference! In terms of glass clarity, and being a true 1-power scope at the sub-$500 price point, the Strike Eagle 1-8 blew the others away! Plus, I think the BDC of the 1-8 is a far-superior design to the Strike Eagle 1-6. So, because of this, I purchased one from Optics Planet with a 10% discount, shipped for just under $450. Not bad. 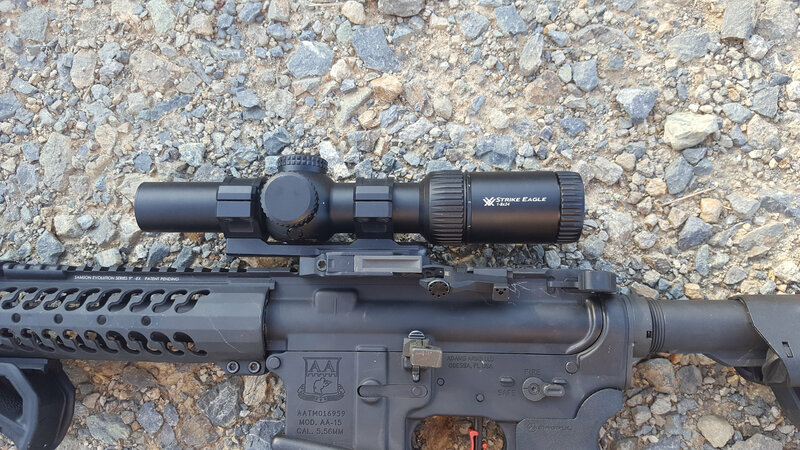 Closeups of Strike Eagle 1-8×24 Riflescope. 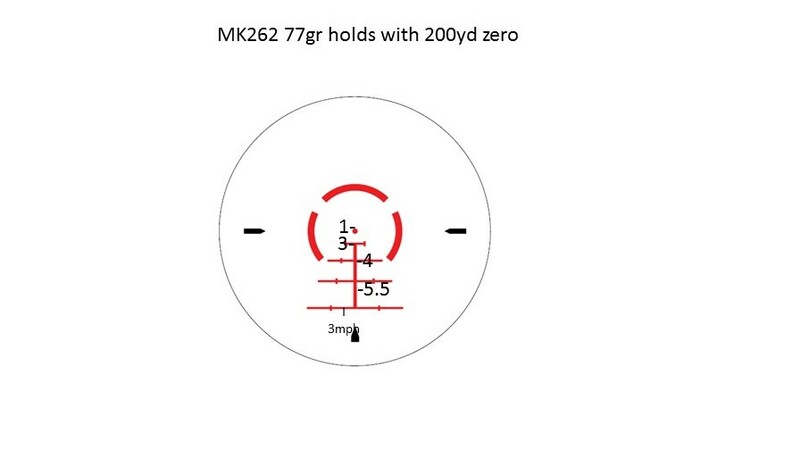 After following the zeroing directions provided in the manual, shooting a 16-inch (16″) AR with MK262 77gr match ammo at an average 2690 muzzle velocity, the BDC line up wasn’t quite exact. However, the ranges did correspond well enough for anything I might encounter in 3-Gun competition shooting Yes, let’s face it, a BDC set from a factory will never be as accurate as using a MIL reticle scope. But for me, I find BDC easier and faster for anything under 500 yards. And, since this is primarily for 3-Gun and not a precision-rifle-shooting/sniping gun, the BDC works great for my purposes. Zeroing was very easy. Adjustment knobs have very positive clicks. Shot 1st at 25yds to get on paper, then at 200yards to dial in center POA/POI. Windage cap even holds a spare CR2032 battery. After zeroing it up at 200 yds, I had no real problems getting 1st-round hits from 250 yds out to 400 yds. I was able to get hits out to 550 yds (max range at the club I was at) in around 6 rounds, once I figured out the winds. If you look at the reticle picture below (click on it to enlarge it), you can see my holds for true range hits. *Note I dropped the zeros. So, for example, 3 is 300 yards. With a 200-yard center dot/hit zero, here are my true holds using 77gr 5.56 match ammo. The vertical tic mark lines off to the left and right of each distance line mark wind holds. 1st line 5mph, second for 10mph. I think Vortex really did their research with this one very well, since for that 550-yd shot (5.5) I had a 3mph wind, and it was between the zero and 5mph mark in the scope. Reticle image courtesy VortexOptics.com. As far as overall clarity of glass goes, let’s face it, compared to my $2,000-plus VCOG, yes, the VCOG is clearer. But, really, the only difference from what I can see with the Vortex 1-8 is that after 300 yards, the edges of what you are looking at are just not as defined or clear as they’d be with the VCOG. As far as noticing waves or anything like that, nothing. Now, comparing it to my almost 10-year-old 1st generation PST 1-4, the quality is worlds apart. I’d never really noticed just how bad the 1st-gen Viper PST really was, with noticeable waves in the clarity of the glass. Holy crap, has Vortex come along way! A lot of shooters want to know if the Vortex Strike Eagle 1-8×24 Riflescope’s a true 1 power, especially for 3-Gun applications. While I’m sure there are some optical measuring devices you could use to test the Strike Eagle 1-8, my preferred method for testing any optic or sight for DR is to see if it can handle speed shooting up close, shooting Kyle lamb’s VTAC 2x2x2 drill (3 targets, 2 shots each, from low ready at about 5 yards). Can the Strike Eagle 1-8×24 Riflescope work well on 1 power for speed? Hell yes! Using this scope, I was able to break my all-time best record of 1.41 seconds, clean, that I’d previously achieved using a set of Strike Industries Sidewinder 45-degree BUIS (Back Up Iron Sights). Using the same rifle with the Vortex Strike eagle 1-8 (on 1 power), my new best time, and new personal record ….6 shots on three targets in 1.36 seconds! (see attached video below to see my 4th run). My only complaint about this optic is that I find the BDC lines a little too thick for my tastes. I think they need to be about half the thickness, around the same thickness as the MRAD lines in the PST 1-4. The reason? Shooting at 12-inch and 8-inch plates at 550 yds, the plates were just about obscured by the thick BDC lines. It made it a little difficult to get an exact center hold. Also, if they were thinner, they’d be less noticeable in your peripheral vision as you focused on the center dot at 1 power, perhaps allowing you to shoot even faster. Let’s face it, getting into 3-Gun competition can be pretty expensive. 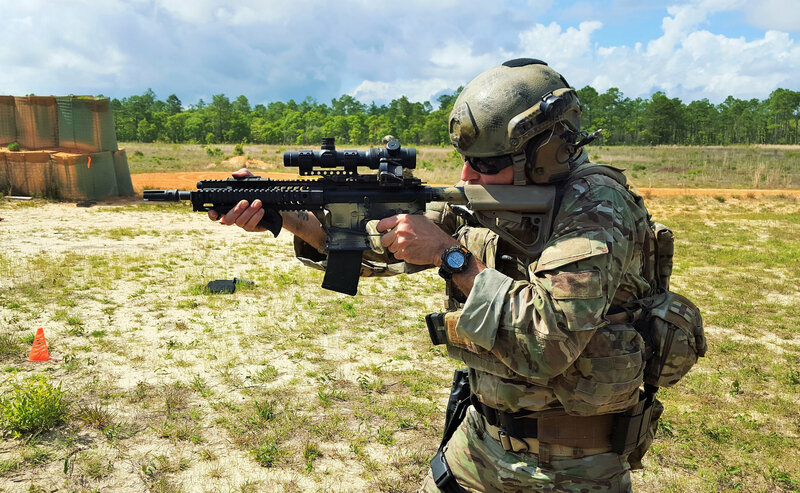 Aside from requiring 3 different firearms, if you want to do well, there’s a mountain of specific gear you must have–and a good scope on your AR is just one of them. If you’re just starting out in 3-Gun I highly recommend you give the Strike Eagle 1-8 a strong look. In fact, I would not even bother with the Strike Eagle 1-6. I think the BDC in the 1-8 is far more practical. And, as I mentioned, I think for 1-6 scopes in general, their time as the premier power range to go with for 3-Gun is ending. Now is it the best 3-Gun scope on the market? No. But for its price, I think it’s a hell of a deal, and will serve end-users well, not only 3-Gun shooters, but also experienced shooters who are looking for a little more magnification, and don’t want to shell out a grand ($1,000) or two just to have it. I own half a dozen AR’s, all with a specific purpose. The Strike Eagle 1-8, so far, has fully satisfied my requirement for hitting targets out to 600 yards, and still be able to pour on the speed up close, with an AR. my primary 3-gun rifle, to include the following: Raptor Charging handle, Strike Industries Sidewinder sights (BUIS), and IMI Defense Front Support Grip. Previous: Defense Strategies Institute (DSI) 6th Annual Military Tactical Communications Summit (September 12-13, 2017): Taking 21st-Century Military Tactical Comms to the Next Level! Next: Gen5 Glock 17 and Glock 19 (Glock 17M and Glock19M) 9mm Combat/Tactical Pistol Models Take a Step Forward, and a Step Back: Best 9mm Glock Pistols Ever? Recoil Magazine Gets First Detailed Look!